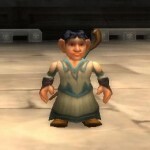 ← [Cataclysm] You want the healer to D P WHUT? Don’t panic! 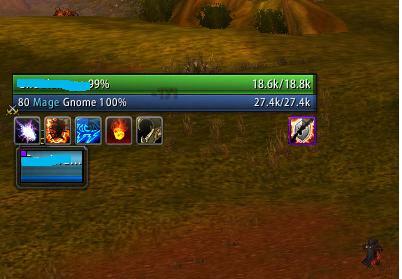 Forget for a second about the mage as DPS role. Think for a second about the other parts of your party/raid. The tank’s job is purely to take as much damage as possible, and the healer’s job is to repair or mitigate as much of that damage as possible.Â The thing you need to remember about curses is that it is additional damage or effects which can be quickly prevented if a decurser is on the ball. Now the other thing to remember is that each time a healer has to decurse it consumes a global cooldown per target. So if Mr Bad Guy does an AoE curse, that would be 5 GCD to get the curses off in a heroic, or alternately heal through the extra damage and deal with any adverse side effects. Healers and tanks already have a lot on their plate, so spending time decursing is yet another task they need to address. Welcome to team heal, mages. Wait...just because you are on team heal doesn't mean you need heal gear. You won’t be responsible for actual healing. Put away your first aid bandages. You are more of a preventive type healer. You react to a curse and remove it ASAP. Recently I went to the duel/bad role play centerÂ of the alliance (Goldshire) and found a friendly level 65 lock to get this screen shot. Oh no! I'm cursed! Whatever will I do? You need unit frames for your party or raid (healer-specific, not-healer-specific, or decursive). Most of these unit frames are a pain to set up the first time, but they do provide useful information so you know when I need to decurse. I recommend grid, and there areÂ plenty of guides on how to set it up. Now what we see here is the curse of affliction debuff is on me. What my grid is setup to do is when any raid/party member is cursed a small purple square appears in the upper left corner.Â The important part is finding out who needs your attention. If you can do that reliably in the default frames, awesome, but there are also plenty of raid frame mods out there (for healers and non-healers) capable of showing who is cursed. Now you know who has a curse, the next step is to clear it off. But being the little DPS machine you are, you’d rather not have to change targets and then fumble around for your decurse button. Well you are in luck. Our healing buddies have macros and mods which allow you to keep targeted on Boss McBuzzkill and still be able to cleanse the curse. You have plenty of options. Â I useÂ clique. As mods go it is pretty lightweight, and the setup is easy. As you can see, it adds a tab to your spellbook where you set your bindings. I have decurse set for shift+left click. 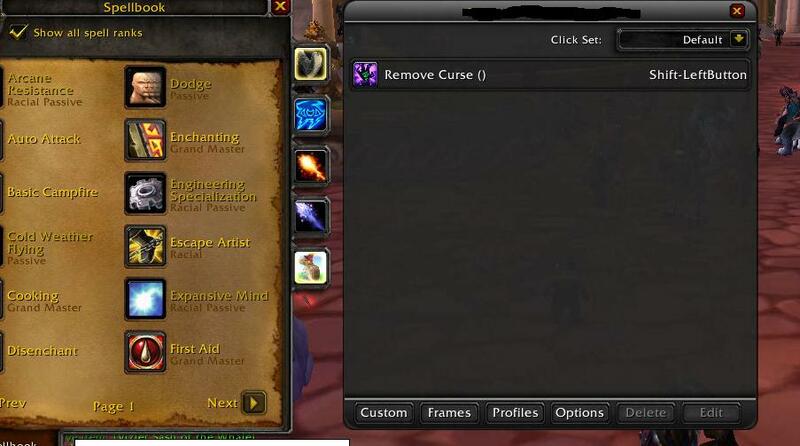 so when my buddies get curse, I just hover my mouse over their box in grid and hold shift and click. Boom! I’m scoring points on the dispell counter in recount showing healers who is their pal. It is just that simple, but I know you are thinking “hey druids and shaman can decurse my job is to DPS so why am I doing this?” Well if you need a quick list, let me spell it out. Every action for casters consumes 1 Global Cool Down regardless of haste. Healers have lots of things they need to be doing, in all honesty unless you are in a fight where every ounce of DPS in your group is the difference between an enrage timer or not, your dps is just the fast forward button on the fight. But as we all should know dead tank=wipe, dead healers=wipe, and dead dps=no dps. Not all heal classes can decurse. Currently all healer classes starting with the letter “P” can’t decurse so you are basically spending more of the healer’s mana to heal through it than you’d spend decursing. Don’t be a jerk. If you are in your normal raid group or guild run, you are building goodwill with your team. This will get you the reputation as a team player instead of a meter whore. That difference is huge for raid leaders when deciding who to take when all things are equal. If you are in a pug you have no idea how good the tank is or the healer is so you are probably saving yourself a wipe or two because as we all should know you can’t outgear stupid. Finally think of it this way: Curses are the calling card of what class? Warlocks. 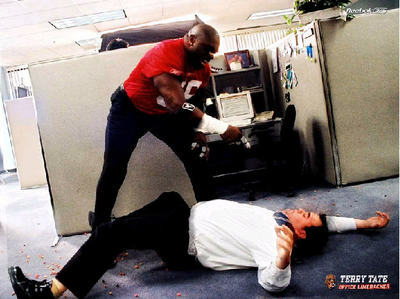 And well I will let Terry Tate show you how we treat warlocks up in our house. So go set up your raid frames, get your clique or mouseover macros set up and next time you see someone cursed, help a healer out. Next time we will show how kiting is a very powerful way to offtank even if you aren’t a tank at all. Perhaps because my two level 80s are a Shaman and a Druid, and my Shaman has been a Healer forever, cleansing stuff was already second nature to me when I first began playing a Mage. I keep Grid up on ALL my characters, because it’s so helpful to see the status of everyone in my party and whether or not I’m out of range of the healer if I’m in a DPS role — so it was the simplest thing in the world to open up Clique and put Decurse on the same clickbind as I use for Cleanse Spirit on my Shaman, and to put Arcane Intellect on another clickbind for easy party buffing. It really comes in handy when doing lowbie LFD with one of my baby Mages. Thank you for writing this. I’m always trying to convince everyone I raid with (even non-healers) to display Grid, or other raid frames, that shows debuffs for this very purpose.